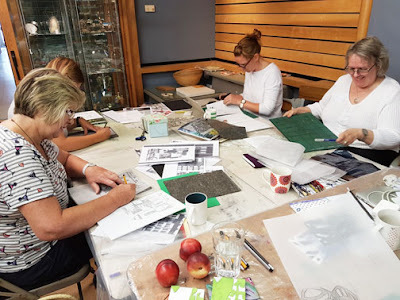 Teaching at home in Ireland and a fabulous workshop at Art Van Go. Look . Draw . Stitch . 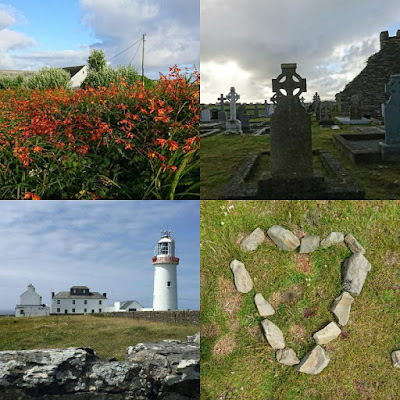 A relaxing retreat on the beautiful Loop Head Peninsula, County Clare, Ireland. 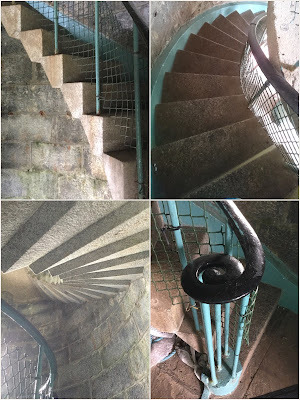 Be inspired by the local dry stone walls, incredible geology, the lighthouse and friendly welcome. 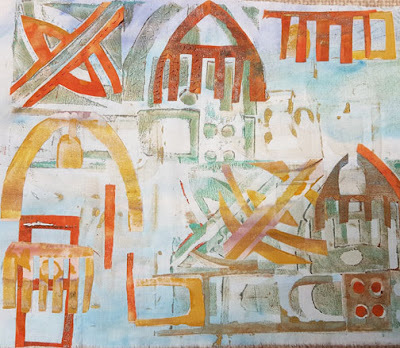 Depending on the weather we will go out to take photos/draw or stay inside and draw from the wonderful views and artifacts in and around my colourful and interesting home..
You will create several drawings, which can then be made into printing blocks. 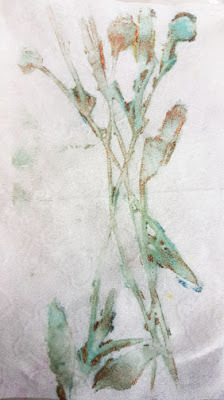 We will print onto paper and fabric to create beautiful layered surfaces on which to stitch - by hand. 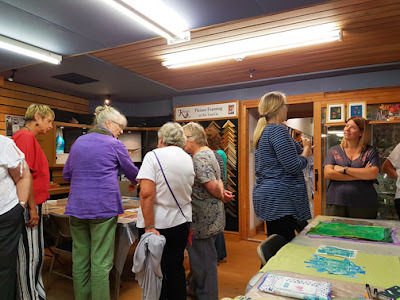 (the following images of the Art Van Go workshop will show you what we will be doing). It doesn't matter if you are a beginner or experienced - you are in safe hands. The price of the weekend will be £250 per person. 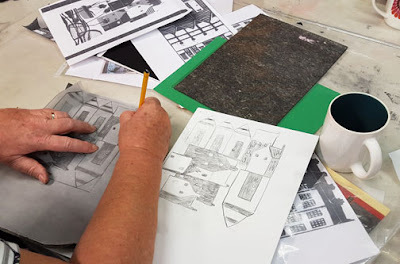 This will include all tuition, some materials, welcome drinks on Friday with nibbles, coffee and teas through the weekend and lunch on Saturday and Sunday. Not included is your accommodation, transfers from airports and evening meals. All these can be arranged by Kim if you need suggestions. There are plenty of local B&B’s. January – Friday 12th – Sunday 14th. 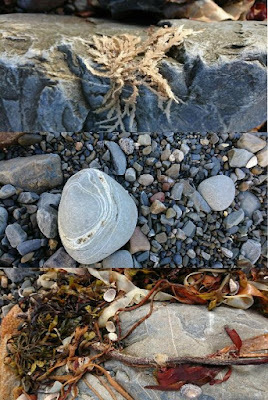 Rocks from the local bay. There will be a dedicated page on my website later in the week. This was my last workshop on the UK mainland this year - and what a workshop it was - pure joy. I wanted to try it out before I launched the weekends here in West Clare, Ireland. 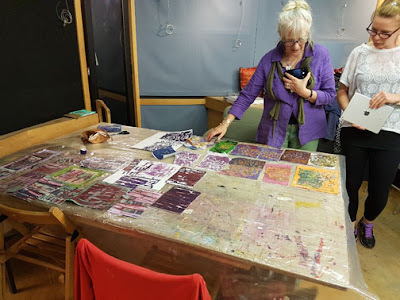 We had a group of 11 - more than enough to play with, and teaching at Art Van Go is always great fun. We are always so well looked after. There are loads of images - too many really - but the work was soooo good. The joy of a baby wipe! Cleaning your printing blocks with baby wipes gives you even more great prints. It's amazing what you can achieve with tracing and carbon paper. Even those of us who can't draw can create fabulous designs. 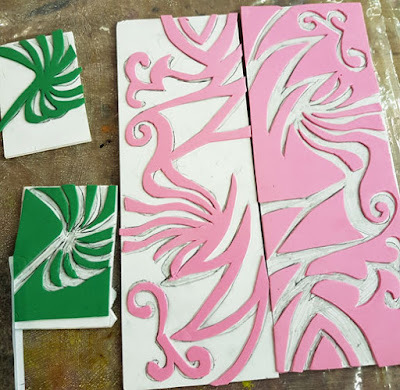 All the students brought in an image and this was turned into a design that was then made into 2 printing blocks, one being the 'negative' part of the design, the other being the 'positive' part. Tracing the designs and making the blocks. 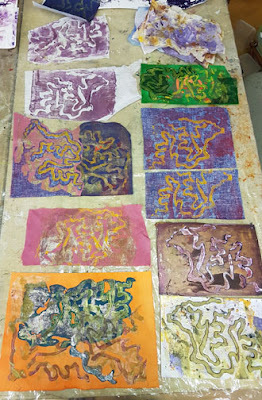 Here are a selection of the blocks made by the group and just a few of the prints. They created so many more - there just isn't space on here to show them. 2 of the many prints. 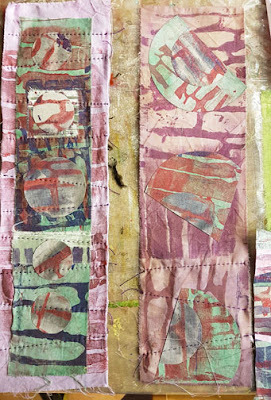 Layers of printed fabrics, cut back, applied and stitched. The printing blocks and print. 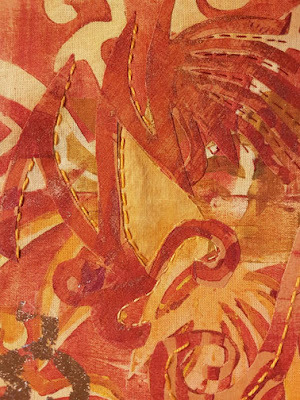 Layers of the same print on several fabrics using applique, cutting back and stitch. 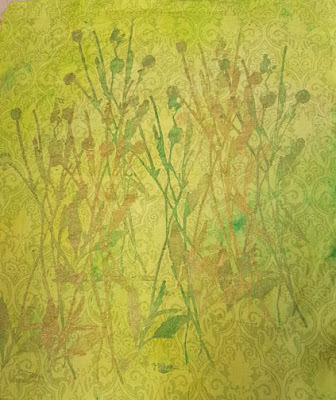 Starting to layer prints, cut back and stitch. 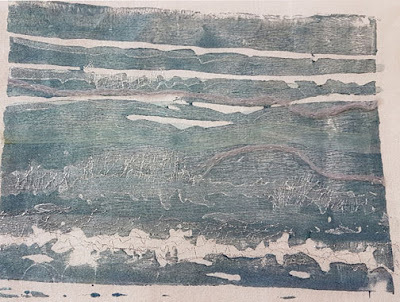 A wonderful table full of prints based on the line of the sea where it meets the sand. A great table of work. 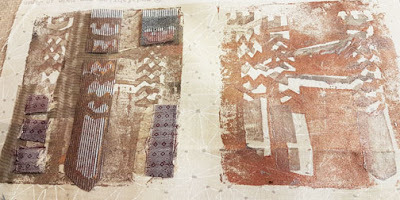 the deign was based on a mosaic, the printing blocks were made and fabrics then printed. A rather fabulous layered, printed and stitched piece. I loved this piece. From a simple design taken from lobster pots. 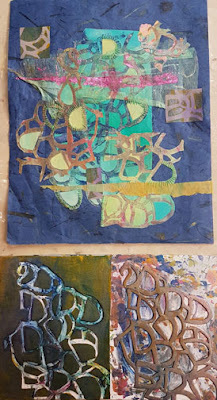 The printing blocks and the stitched sample. One of several printed, layered and stitched samples. Each member of the group produced several great prints. There just isn't room on the post to show them all. You csn see the inspiration for these prints on right on the middle. The printing blocks from the design are bottom right. 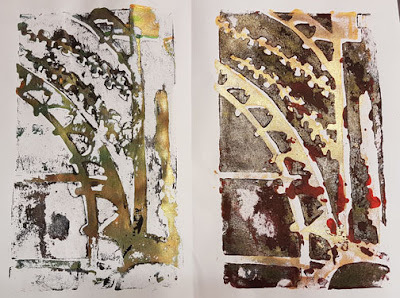 The beautiful prints are on the left. Just one of the prints produced from these blocks with applique of polyester organza with sympathetic stitch. 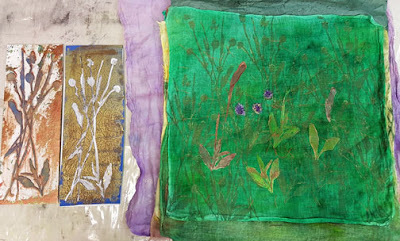 The following 3 photos shows the process from design, through to print to finished layered sample - ready to be stitched. Your starting point can be almost anything. A photo, a drawing, a photocopy. With tracing and carbon paper almost anything can be achieved. It's great fun. You don't need to be able to draw. This is the print from both blocks - one on top of the other. 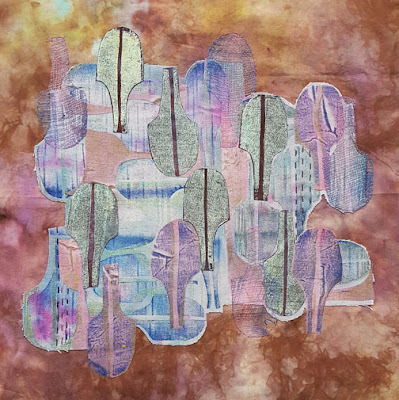 Various prints on similar fabrics cut up and applied onto a background fabric. 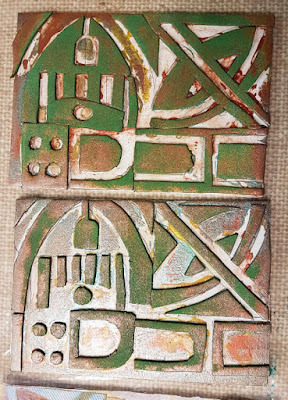 The printing blocks on the left were used on this and the following 2 images. 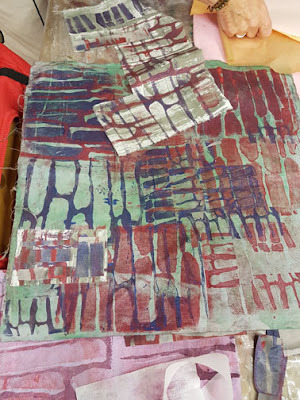 One layer of print . .
Several layers of print that have been cut back and worked into. 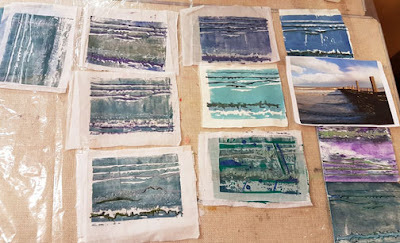 A few more gorgeous layered and stitched prints. This was a very satisfying 2 day workshop for me. I have been wanting to try this out for a while, with students from beginners to experienced. 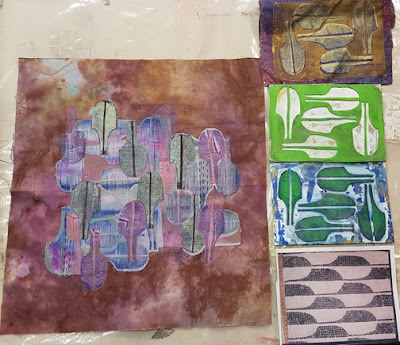 Everyone created their own designs, their own printing blocks and layered samples - some even had time to stitch. The most important thing is that the students can do it all again, and again. . so their designs will always be original. It was great to spend some time with Viv and Kevin of Art Van Go, they have become great friends of mine over the last few years. The 'show and tell' at the end of the workshop is very important. Everyone gets a chance to see what has been done. It is a great way to finish up a workshop. Viv having a good look at all the work. If you find this way of working interesting and fancy having a go with me in Ireland within a group of 6 students. Then check the dates and see if they are still free. If you email me I can send you a booking form or you can just ask questions if I haven't covered something you need to know. You can come on your own and make new friends, organise your own group or come with a partner and they can go and explore while you are on the workshop. There are so many possibilities. Hello Diana - well done on the fabulous samples. 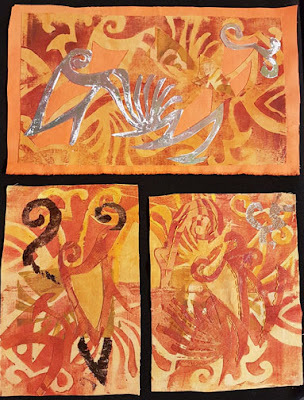 A book review and workshop news . . . 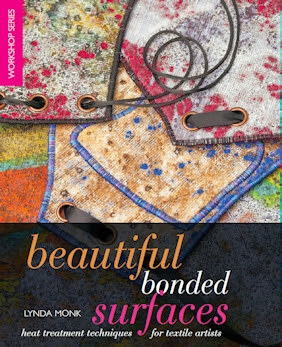 The cover of Lynda Monk's latest book. I love looking at new books, stroking the pages - and yes - inhaling them . . . I think a lot of you will know what I mean. I do read a lot of books, but being totally honest, not all of them. I do mean to . .
Lynda's new book is one you can't put down and doesn't take long to read. It is a real page turner. The book is full of gorgeous images and the information in the book is very clear. Lynda is a great tutor, always encouraging and so generous with all her information. The way Lynda develops and shares her techniques is always well set out, and quite frankly, very exciting. The book covers many layering techniques including two products that I am very fond of - Decovil and Bondaweb. Here a few images from the book. I don't want to show you too much or you won't enjoy the lovely surprises that are in store for you when you get your hands on a copy of the book. 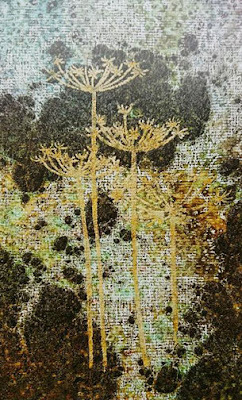 Xpandaprint pushed through a Thermofax screen and then zapped with a heat gun to achieve this beautiful design. 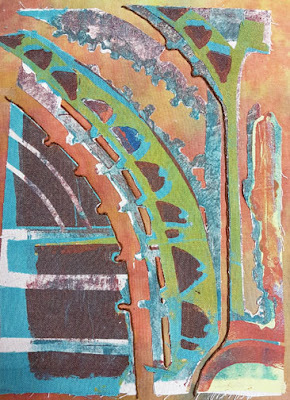 The background is one of Lynda's gorgeous layers of Bondaweb and Tyvek. If you don't have a Thermofax screen you could use a stencil. The paint effects that Lynda shares are truly beautiful. I was lucky enough to see these finished garment at the NEC in March - what a remarkably exhibit they made. There a several coats and hats featured in the book, as well as shoes, decorative boxes and bags. 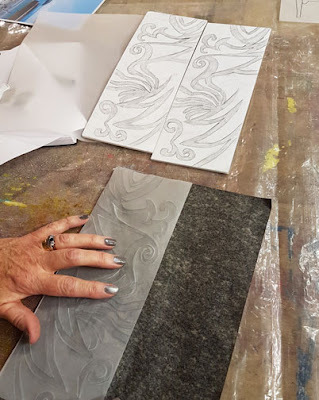 Lynda's finish on her work is exquisite. 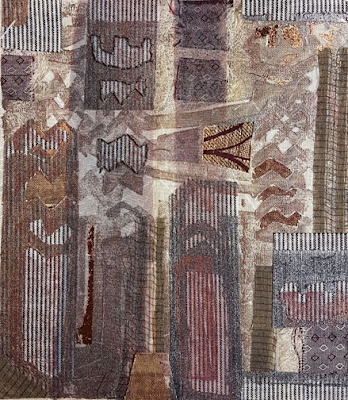 It is one thing to create the fascinating techniques and layers, it is another to cut and stitch them into such beautifully finished work. The result is stunning. It really is a fabulous book. 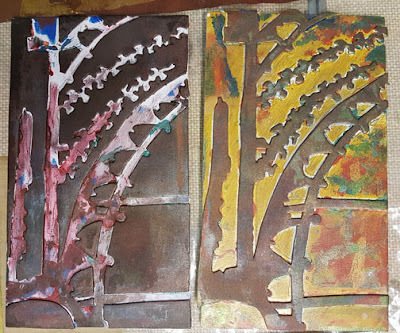 A couple of places have become available in my workshop Art Van Go this month. It has been fully booked for some time but these things happen. It is my last workshop on the UK mainland for the next 18 months or so. 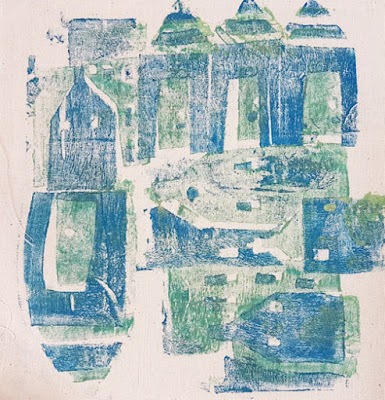 Bring an image from your travels that you love and you think would make a great printing block. 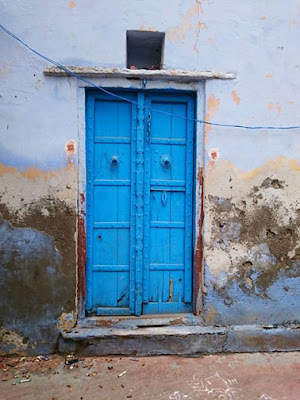 Be inspired by your travels - from a simple rock formation, a stunning arch or an exotic elephant ride in India. 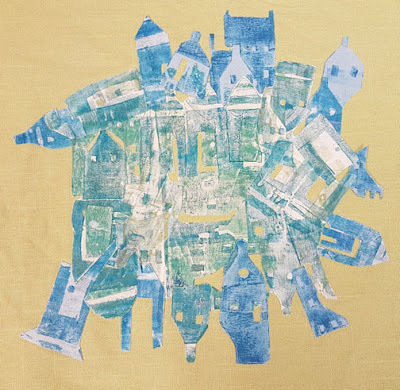 Make a printing block and using layers of fabric with reverse applique and hand stitch to create a beautiful memory. We are all looked after so well at Art Van Go, it is a great space to work and of course there is the shop, an Aladdin's cave of colour and delights. The online workshops are running well. I am having such fun chatting to the students online. At the moment we have students from South Africa, Italy, Holland, America, New Zealand, France and Canada working alongside students in the UK. Because the workshops are available for 6 months, if life gets in the way for a few weeks - you can still carry on when you have time again. 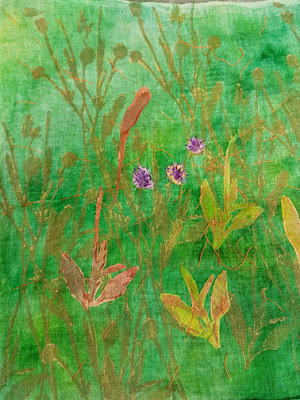 A stitched 'pretty' by Kathy Gledsdale on A New Starting Point. One of the many things that have surprised me since we launched the online workshops is that a lot of of the students are enrolling on ALL the workshops as they roll out. It is very encouraging. I am starting to think about packing to drive over to the UK for the Festival of Quilts next week. I will demonstrating on the Vlieseline stand on M8 - opposite the Masterclass Quilts stand that Vlieseline sponsor. Do come and say hello if you are at the show. That's all for now - hopefully see some you next week. Hello Jill- see you soon tablespoon! Hi Diana - I haven't forgotten you. Hello Tod - sending you love - will ring this week.